The Yorkshire and Humber region has established itself as the UK's powerhouse for the process and energy and renewables sectors. With such a concentration of businesses in one area, the competition for skilled workers is high. But the pool of available talent hasn't grown in line with demand and, along with the rest of the country, the Yorkshire and Humber region has been experiencing a massive shortfall in the engineering, science and technology skills needed to operate and service these industries. Along with many other employers in the region, tackling this skills shortfall has become a priority for Fabricom GDF SUEZ (UK). When the Employer Ownership of Skills Fund was announced, it was clear that it could provide a big boost to the efforts already being made in our region and employers quickly came on board. Within a very short space of time, a consortium of over a dozen regional employers, led by Fabricom GDF SUEZ (UK) and managed by HCF Ltd, put together an ambitious plan to tackle the massive skills shortfall in our region, and we heard on 2 August that our bid had been successful. Our pilot will provide accelerated pathways to productivity, employment and excellence for apprentices and people wishing to enter our sector. It will help boost apprentice numbers, and improve the work-readiness of new recruits and unemployed people. The programme will utilise the Centre for the Assessment of Technical Competence (CATCH) facility, the largest industrial training facility of its kind in the UK. By creating new forms of authentic, site-based training and assessment, apprentices will be able to become more productive more quickly by reducing the time it takes to complete assessment criteria. New accredited pre-employment programmes will create opportunities for unemployed people in the region, with programmes that directly address hard-to-fill vacancies. We will also create the UK’s first multi-disciplinary advanced training programme and assessment that replicates the key elements of a plant shut-down, engineering maintenance and start up. 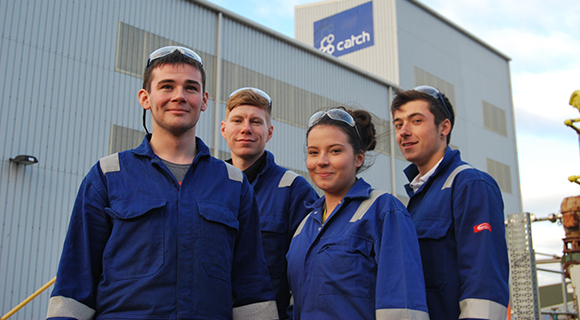 This innovative programme will be aimed at existing employees as well as new apprentices. All the strands of our plan involve employers becoming really engaged with the process, working with training providers to design programmes and providing site visits and practice for those in training. Through this collaborative approach, we believe the pilot will not only address our current skills challenges but leave a legacy of greater productivity and growth in our sector. Fabricom is a leading multi-disciplined engineering project management and construction organisation, providing professional services to the oil, gas and power industries from its five UK locations throughout the UK. Fabricom GDF SUEZ (UK) employs over 1000 people throughout the UK working on Projects that demand highly skilled Engineers and Construction Technicians. HCF Ltd is a not-for-profit industry led partnership supporting the strategic industries in the Humber region.